If you read my last post, then you know I’ve been thinking a lot about how to bring innovation to the classroom. All of us at Learn Safari have! After all, this is what we’re all about; democratizing education so that everyone in the world has access to learning. When we think of innovation, technology always come to mind. However, it’s not enough to introduce tech to a classroom. Just adding computers, tablets and electronic boards is not enough to engage students and prepare them for a changing world. Our children need to use technology in a practical way to solve real world problems. Here are ten schools that are using technology to do exactly that, with some amazing results! Khan Academy is probably the world’s largest educational non-profit. They produce a lot of independent learning courses that people can take at no-cost. At Khan Lab School, they focus on testing and developing innovation in the classroom to bring about the latest in learning. They also have an interdisciplinary, project-based approach to learning. Their day is divided into individualized learning time, small group seminars, and project time. A great deal of their individualized learning time is technology based. For the Lower School Language Arts they use programs such as Quill, Lexia, and Newsela. They use  Khan Academy for Math and Computer programing, Labster for science, and Growfit for Physical education. When you start looking into high tech schools, it’s impossible to not come across High Tech High. 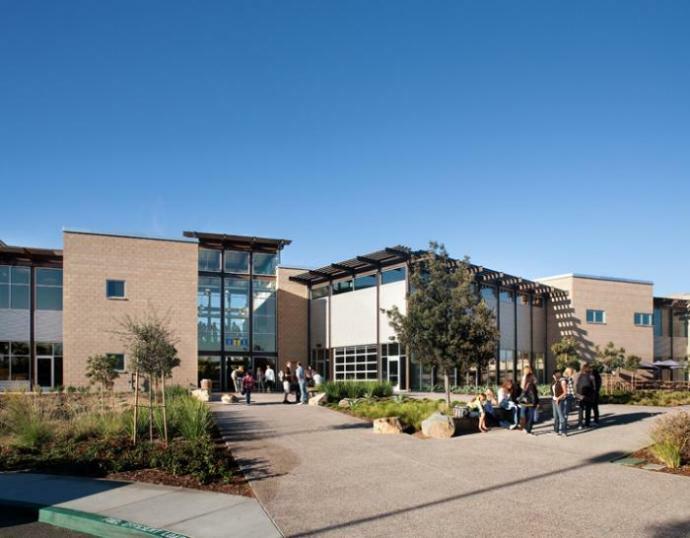 High Tech High opened in San Diego, C.A. in the year 2000 as a small charter school that planned on serving 450 students. Since then, it has grown into a series of 14 interconnected schools. The curriculum is project based and the students develop their skills and knowledge through their participation in projects with real world (and often community focused) implications. According to Larry Rosenstock, CEO of High Tech High, “the purpose of ‘tech in High Tech High is not for consumption. It’s for production.” They use computers to do everything from research, to building projects and making presentations with programs such as After Effects. Some of the projects that the students have worked on include developing a DNA Barcoding sequence to assist African officials in the apprehension and conviction of poachers; designing, prototyping and building an urban agricultural system, and a Breaking Bread project where they shared stories of culture and tradition and reverse engineered bread machines. Rocketship’s blended-learning model involves 75 percent of classroom and 25 percent of online instruction. They have specific times when students go to a separate room where they work on computers to focus on individual learning needs and general skills practice, allowing classroom teachers to focus on student interactions, concept extension and critical thinking skill development. Rocketship uses a variety of online content programs in reading and math during the Learning Lab time. For reading, these include Headsprout, Accelerated Reader, and Rosetta Stone. For math they use DreamBox, Reasoning Mind, and ALEKS. The school is currently working with SRI International on a study to measure the effectiveness of its online instruction. Unlike traditional schools that focus on testing and a basic curriculum, AltSchool is a school that focuses on improving tech skills and helping students become flexible thinkers that can adapt to our changing world. According to CEO Max Ventilla "We should be educating children from a whole-child lens where they learn to problem solve, social-emotional learning is prioritized, students should be part of the goal-setting process, and so on." They focused on personalized learning, in which students work to reach milestones. They have created curriculum and products to help children digitally record, analyzed and plan their progress. The school, which serves students ages 4 to 14, began in San Francisco in 2013 and now has lab schools and partners in New York, California and Florida. This tech magnet in Sanford Florida was named the “most connected classroom in America” by U.S. News & World Report. All the students are given laptops and each classroom has at least two desktops and SMARTboards. They can also boast of ten computer labs and an in-house repair center known as Laptop Central. The school is a member of National Academy Foundation and has been recognized as a Distinguished Academy for eight consecutive years, which is the NAF’s highest honor. Crooms offers students numerous opportunities of job shadowing, internships, and even participation in their showcase event, the Seminole County TechFest. The school is recognized as a Merit School of Excellence and has the highest rating from Magnet Schools of America. This high school in Liverpool, England is a high school that emphasizes math, business, computing and enterprise. This school stands out for its architecture and is considered to be a “memorable landmark.” It has labs, art studios, a motorcycle-engineering center, recording studios, and a theater. It has even been ranked as the 25th school in the entire United Kingdom. The school offers various enrichment options, including a Digital Entrepreneurship Network, conversational Spanish, and Teaching English as a Foreign Language. They assist students in applying for jobs and college and connect them with partners in the community. This is a STEM magnet school in Alexandria, Va. USA. The academic disciplines are integrated. Freshmen take a technology survey course as a foundation. They have courses in math, science and tech (integrated with humanities), world languages, fine arts and more. 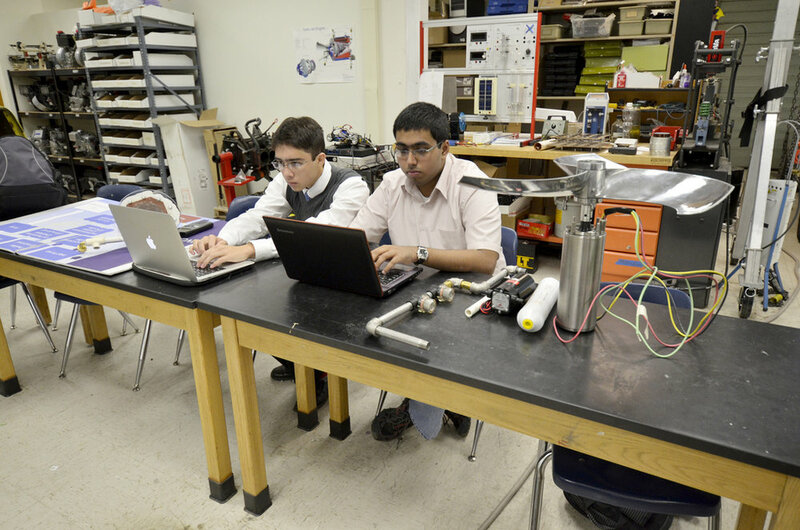 Seniors complete a major research project, either on campus or at a government or university research lab the school partners with, in categories such as astronomy, energy systems, optics and modern physics and more. They offer a wide array of tech resources, discount tech for purchase, school wide WIFI, an online Student Information System, and they also make use of Blackboard. The school even boasts of its own research, such as the chemical analysis lab with chemical nanotechnology equipment and the neuroscience lab with the electroencephalographic system! Founded in 2013 in Amsterdam, this is an extremely innovative school model. Students begin with an Individual Development Plan (IDP), which is evaluated and readjusted regularly by the child, coach, and parents. Students are then offered personalized learning challenges they can choose from. There are no classes, no daily schedule, simply ample space where students can learn at their own pace and in environments of their choosing. Students receive fully loaded iPads once they reach 4th grade. They use a program called sCoolProjects, where they can work with a mentor in order to develop a project. They also use sCoolSpace, where they can access the school's virtual community center to interact with classmates and tutors from anywhere in the world. They also have a tool to store all of their work for monitoring and the creation of their IDP. Founded in Peru in 2011 by Carlos Rodriguez-Pastor , the school uses several different forms of instruction — tech-heavy online learning, guided lessons, group work — in a setting that was designed to be modular and adaptable to the location. The pedagogical approach of Innova Schools encompasses three concepts: autonomy, collaborative learning and integrated technology. The focus is on students building their own knowledge. Students spend half their time immersed in guided online education and the other half receiving more traditional and collaborative instruction. The tech-heavy school, which is open to kids in Kindergarten through 11th grade. In 2013, 61% percent of Innova second-graders reached proficiency in federal math exams, in comparison to the national average which was just 17%. Located in Lincolnshire, England, this school was dubbed as Britain’s “most high-tech” school! What makes it so? It’s the room that the students call “the magic room.” A 4D theater that transports children to any number of settings so that they can truly experience what they are studying. The 4D room uses video that is projected onto screens that are floor-to-ceiling, lighting, sound, and an interactive floor space to create an experience that is truly "immersive". The school focuses on children 5 to 11 years old and both teachers and students love the use of their 4D room and believe that this technology is fun, inspirational and goes well beyond simply having computers and iPads in the classroom. It’s not just about using technology. What’s important is how it’s used. We need to rethink how we teach and we need to have parents and teachers equipped with the knowledge of what can be done! We shouldn’t just try to entertain students with gadgets. We should be purposeful and think about how we can harness the power of tech to further our goals and solve real world problems! Do you agree? How can we use technology to innovate our classrooms? Do you know of any schools that should be on this list? Let us know your thoughts in the comments! Older PostIntroducing the Class of 2031: Are You Ready for the Future?